Identify areas in your yard that are very susceptible to snow accumulation and offer protection to trees and shrubs in those areas. Weather in the Mid Atlantic region is somewhat unpredictable during the winter season, as it can change in the blink of an eye. We have experienced a few snowy days this year, and we should anticipate a few more over the upcoming weeks. Cold temperatures, mixed with high winds and icy conditions are not exactly ideal for the trees and shrubs on your property. However, the good news is that there are a few measures you can take to protect your property’s plant life during the coldest months of the year. Check out these helpful tips for protecting trees and shrubs from winter damage. Freezing temperatures can quickly cause damage to shrubs and trees. When soil freezes over, a plant will be unable to absorb water, which may lead to desiccation. For this reason, it is a good idea to water your trees and shrubs at the end of the fall season. You want their roots to have a nice supply of water before the ground freezes. Another thing you can do is apply a thick layer of mulch around the base of a plant to provide it with insulation after the ground has frozen over. It is incredible how quickly snow can accumulate in one spot. Snow is incredibly dense, and the weight of it has been known to completely snap tree branches in half. It can also quickly smother shrubs if there is too much of it. Since this is the case, you want to identify areas in your yard that are very susceptible to snow accumulation and offer protection to trees and shrubs in those areas. 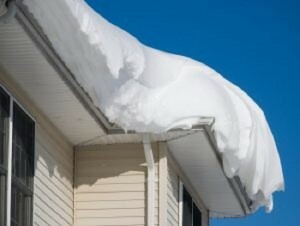 For example, maybe there is a particular spot on the side of your home where snow seems to always to slide off your roof or a spot that snow plows push excess snow too. It is wise to install some form of protection around or smaller plants to prevent any major snow accumulation. Wind is more powerful than many people realize. Trees and shrubs can easily experience damage from harsh winter winds. If you want to protect your trees and shrubs from high winds, you need to identify the problem areas on your property and install some sort of barrier for your plants. Many experienced gardeners rely on burlap to shield their plants from high winds. This entry was posted on Thursday, February 15th, 2018 at 10:05 am. Both comments and pings are currently closed.